Dwayne E. Rollins, MD Now that you’ve reviewed our information and have determined that you need to see a doctor, Dr. Rollins would be happy to help. Our office sees adults and children with ear, nose and throat problems. We are conveniently located in the St. Albans area of Queens, New York. Dr. Rollins is an excellent doctor. He took the time to discuss my allergies/sinus issues, in addition to even showing me a diagram of what was going on with my sinuses. Most doctors don't take the time to explain in detail, but he was really thorough. My sinus related issues are finally subsiding thanks to Dr. Rollins. An intelligent and compassionate doctor who does his work with skill and grace. His office reflects him, well-run and reasonable. I Would highly recommend him! Thank you, Dr. Rollins. Dr. Rollins is incredibly knowledgeable and answers all questions asked of him in a way that is understandable to patients. I couldn't be more pleased. His staff is pleasant and incredibly helpful. I highly recommend Dr. Rollins. I had the pleasure to visit Dr. Rollins today for the first time regarding an ongoing congestion issue. He was very thorough, informative, very pleasant and caring. I highly recommend Dr. Rollins to anyone who needs to see an ENT. Dr. Rollins took great care of me. I've had an inflamed throat for multiple reasons and he helped me pinpoint a very likely solution that had not been brought up before by another doctor. He is very helpful and knows his field well. I got an appointment the same day I called too. I highly recommend him. Otolaryngology focuses on ear disorders including those that affect hearing, balance, and nerve pain. 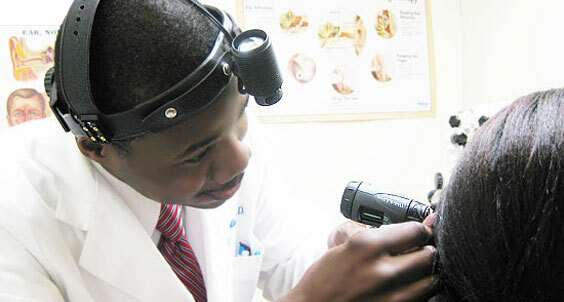 Ear infections are another disorder that ENT physicians treat. Allergies and sinusitis are two common nose issues that otolaryngologists treat. Difficulty with smelling is another reason a person may seek the treatment of an otolaryngologist. Patients with throat problems, difficulty swallowing, and voice box diseases receive treatment from ENT doctors. Esophageal disorders are another issue that falls under the otolaryngology specialty. Otolaryngologists are also involved in the workup and management of both benign (non-cancerous) and malignant (cancerous) growth which occur in the head and region. At the medical office of Dr. Rollins, all of our knowledge, capabilities and technology in our practice have but one focus: the quality of your experience. We strive to provide you with exceptional one-on-one care. We provide service to both adults and children. When you visit the office of Dr. Rollins, you'll be treated respectfully, warmly and compassionately. Dr. Rollins is an excellent doctor. He took the time to discuss my allergies/sinus issues, in addition to even showing me a diagram of what was going on with my sinuses. Most doctors don't take the time to explain in detail, but he was really thorough. My sinus related issues are finally subsiding thanks to Dr. Rollins. An intelligent and compassionate doctor who does his work with skill and grace. His office reflects him, well-run and reasonable. I Would highly recommend him! Thank you, Dr. Rollins. Dr. Rollins is incredibly knowledgeable and answers all questions asked of him in a way that is understandable to patients. I couldn't be more pleased. His staff is pleasant and incredibly helpful. I highly recommend Dr. Rollins. I had the pleasure to visit Dr. Rollins today for the first time regarding an ongoing congestion issue. He was very thorough, informative, very pleasant and caring. I highly recommend Dr. Rollins to anyone who needs to see an ENT. Dr. Rollins took great care of me. I've had an inflamed throat for multiple reasons and he helped me pinpoint a very likely solution that had not been brought up before by another doctor. He is very helpful and knows his field well. I got an appointment the same day I called too. I highly recommend him! I was extremely impressed by Dr. Rollins and his office staff. I needed a minor but urgent operation. He was totally professional and did a great job explaining to me the problem and the solution. He also kept my two appointments on time, which I appreciated. I totally recommend him. Dr. Rollins is very nice, clear, and efficient. I was in and out of there in 10 minutes and I made the appointment on the same day. His staff is also very friendly. Highly recommend visiting if you have any ear, nose, or throat issues. There is a reason Dr. Rollins averages five stars. He is the finest physician I have ever met. If you need ENT services, this is the man to trust. I only wish all my doctors were this professional, this thorough, this competent and this compassionate. Dr. Rollins and his staff truly care about his patients. He tries to go non-invasive unless he has to, which I appreciate. He's a good person and a very knowledgeable doctor. He takes the time to explain things in a way that you completely understand what is going on. Call our office today at 718-978-5447 and we will be happy to find an appointment time to fit your busy schedule. We do our very best to avoid the long waiting times that are so common in many offices. Copyright © Dwayne E. Rollins. All Rights Are Reserved.